Glad to have found a great Dentist and team in my new neighbourhood. Everyone was really kind and lovely. Already recommendedto my husband and coworkers. Glad to have found a great Dentist and team in my new neighbourhood. Everyone was really kind and lovely. Already recommended to my husband and coworkers. A friendly family dentist, Dr. Sahar Moeini has been treating patients in Florida and California for many years. Having earned a Biology degree from the University of California, San Diego, Dr. Moeini pursued her dental training at Nova Southeastern University in Florida. 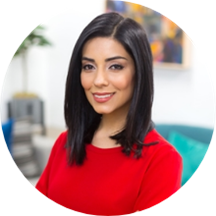 Today, Dr. Moeini stays active and current through her professional memberships of California Dental Association, Academy of General Dentistry, and the American Dental Association. Committed to offering the highest quality, personalized care to every patient, Dr. Moeini is known for her exquisite attention to detail and for providing ample time to discuss treatment goals for every patient. She is known for her gentle hands, friendly demeanor, and caring approach, especially with fearful patients. Together with her team of dedicated specialists, Dr. Moeini offers caring and compassionate dental care using the latest equipment and techniques. Strongly committed to dentistry-related charities, Dr. Moeini is a proud supporter of the Thousand Smiles Foundation, a nonprofit organization that provides dental care and procedures, such as cleft palate surgeries, to children in Mexico. When not practicing dentistry, Dr. Moeini enjoys traveling, cooking, fitness and spending time with family and friends. This office is great! The dr was Very nice and calm and explained all my options. The hygienist was very caring and patient and attentive..I am very nervous at dentist and they made sure I relaxed and took there time ..definetly reccomend!! Friendly staff, efficient appointment, would recommend! Very prompt service. Didn’t recommend things that were not needed. I scheduled a last minute appointment due to a dental emergency and the office staff was extremely accommodating and professional with assisting me. Dr. Moeini was kind, knowledgeable, and patient with me while thoroughly explaining theplan of action for my dental care. I would highly recommend Dr. Moeini and this dental office. Everyone was super friendly and helpful! They were great atl explaining what was going on, what each step of the process was, and walked through our options. Scheduling a follow up date was easy and painless! Free parking on the roof also a huge plus. Dr. Moeini was amazing and her staff were very friendly. I didn't see Sahar but the team who looked after me were really friendly and helpful. They are also the first people I have experienced that have actually taken the time to advise me what is included and excluded in mycoverage and made sure I was happy with any additional costs before going ahead. I am from the UK so have always found the healthcare system pretty confusing but they made it really clear and simple! Dr. Moeini is an amazing doctor with a great staff. She immediately acted invested in my long term dental health and clearly explaining my numerous options/questions. During the dental work she was detail oriented and explained every step. I am thrilled to have found my local dentist. I had a positive experience. Doctor and staff were really nice and professional. Wasn’t painful at all. Dr Moeini and staff were fantastic. Not a single negative thing to say. Highly recommend. I had had a bad experience elsewhere so I was really nervous (even for a routine check up).... but this was night and day different and so so much better. I had to get a cavity filled and I didn’t feelit at all! I’m a huge baby, so this was a big deal. Thanks so much! Pretty efficient. Nice front desk. The entire team was very professional and made me feel comfortable through the whole process. I was a bit nervous visiting a new dentist for the first time after my longtime dentist retired, but from the moment I walked in, itwas clear that they were extremely competent, efficient and knowledgeable. All their equipment seemed new and cutting edge compared with my last dentist which also made me feel comfortable and in good hands. Definitely recommend! I haven't been to the dentist in a while and was dreading going. My appointment went great! Everyone was super nice and accommodating. Would recommend! Dr Sahar Moeini was very professional and nice. Dr. Moeini and her staff were top notch! They took care of my brother and me with better care than any other dental group I have ever encountered in the past. Very deserving of these high reviews. Fantastic dentist. I had an emergency when my tooth broke and they were able to accommodate me right away. Great bed side manner and incredibly warm and professional. Dr. Moeini was very friendly and informative. The facility was very clean, their service was excellent. I felt like they actually cared about my dental well being. I wish I could've kept seeing them however, I moved out of state. I would definitely recommend them. I was immediately taken care of upon arrival. Every staff member was friendly and accommodating. I felt taken care of in a very professional manner. Dr. Moeini and the staff were super nice and friendly. They made sure I was okay throughout the entire process. Dr Moeini was very patient and polite. She explained my entire treatment plan step by step and answered all my questions efficiently. I felt at ease with the whole process. my first treatment went smooth and painless I hardly felt anythingfrom start to end. I am beyond satisfied. Thank You Dr Moeini and the rest of their team everyone was great! Super friendly and nice. Very thorough as well. They taught me some new things that I'd never learned before (re: dental hygiene). Overall fantastic! It was great! Everyone was so thoughtful and friendly. I hate going to the dentist but they definitely eased my anxiety a bit. Dr. Moeini was wonderful. She and her staff are incredibly professional and kind. I would highly recommend her to anyone. Very family friendly. We go for my son's pediatric teeth check-ups, and he loves being a big boy for Dr. Moeini. Fantastic dentist. She was friendly and prpfessional. But what I love most about the visit was the hospitality. I find that dentists and doctors often don't provide value to the customer they are serving the way that a really good restaurantdoes. But both types of services (food, appointments) can create added value through hospitality. Every person I encountered at the office was warm and gracious. Highly recommended. I was very scared because I have not been to the dentist in 8+ years. Dr. Mo was very nice and made me feel comfortable. Another great visit at Dentex Dental. Staff were outgoing, friendly and professional. I was taken back early and my visit was fast and efficient. Completely satisfied! See you in 6 months! Dr. Moeini was awesome! I think I finally found my dentist in L.A. Not only that but her office staff was beyond friendly and helpful as well! Finally they have free parking right next to the building too. Highly recommend! Amazing graphics experience. From the front desk to the doctor, everyone was so friendly and helpful. They were thorough in explaining all of the procedures, always made sure I was comfortable and happy to answer any questions, and just overall seemed very concerned in my well-being. Really informative about treatment. Constant checking of comfort/tolerance level. Passionate about her profession.Really warm and friendly staff. So far, so good. Although I made the apt late on Sunday evening online, they saw me right on time early Monday morning. The front desk attendant was cheerful and displayed outstanding customer service. The xray machine was more advanced thanI have ever experienced at other dentists. The dentist who saw me explained my situation and went over my options very clearly. I was fitted for a dental bridge which they are making in house and said would be ready this afternoon. Dr. Moeini was great with addressing my issues as well as being very gentle handling my fillings. One issue though - the dental assistant, Catie, was very rough with the cleaning. I felt she was very careless and left my faceand neck completely wet. Worst of all, she did not apologize for it. I would recommend Dr. Moeini as long as I have a different dental assistant. Very professional doctor and staff! Made me feel comfortable throughout the whole procedure (deep clean and put a temporary crown). Very clean and high tech, too, which puts me at ease. Highly recommend! I recently moved to Los Angeles and am truly ecstatic to have found Dr. Moeini to look after me in this city. She is caring and diligent. She was able to quickly fix a problem tooth that I have had issueswith for several years. Prior to Dr. Moeini, I have had 3 doctor in 2 different cities work on this tooth and none were able to thoroughly fix the problem. She is candid with her diagnosis and provides solution and alternatives if possible. During my exam, she really took the time to review all of my concerns and followed post procedure to ensure I was doing well. I highly recommend her, as she goes above and beyond with her patient care. Dr Moeini is very professional at her job and she has an awesome personality.